Corban Manor Inn is a beautifully appointed bed and breakfast, built in 1875. The Inn opened July 4, 2016 and was completely updated, designed and decorated with guest’s comfort in mind. Guests may relax in the large living room by a cozy fireplace or retreat to their second floor guest room, each complete with modern en suites. In addition to the three bed and breakfast guest rooms, we have an on-site, two-level vacation rental apartment with separate entry (the vacation rental does not include breakfast or daily maid service). Experience quiet, private, elegance choosing in-room, silver service breakfasts, or dining downstairs--to delight your traveling palate, our "glocal" breakfast menu infuses the best of local fresh ingredients with an extensive international presence unique to the Twin Cities highlighting the best flavors our diverse world offers. Enjoy off-street parking and an entrance surrounded by gardens--conveniently located just steps from designated parking space. 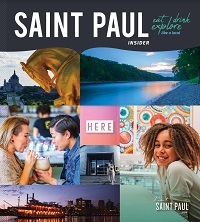 The Inn is located one block from Summit and Selby Avenues and less than a mile to downtown St. Paul, 7th Street and Grand Avenue. Park your car and stroll among the historic mansions, enjoy restaurants, unique shops, and entertainment all just a short walk from the Inn.